One theme that has come up over and over again in recent Illinois gubernatorial debates has been the economy. Everyone seems to agree that the state's economic situation has some room for improvement, to put it lightly, but there are a lot of mixed messages out there about how it got this way and how we can fix it. Being home to one of the biggest cities in the U.S., Illinois actually did have a strong economy for many years. However, now our underfunded pensions, the budget crisis and the inability of our government to agree on what to do next continue to be some of the biggest problems the state has. NBN sat down with Kellogg professor Therese J. McGuire to learn more about the Illinois economy and what it means for Evanston and Chicago residents. Comments have been edited for length and clarity. 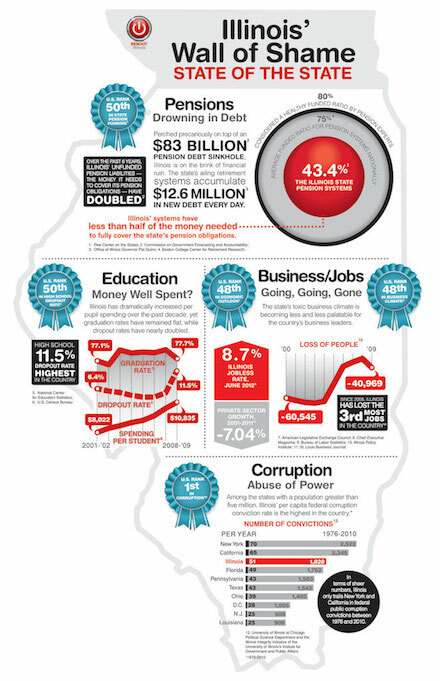 NBN: What are Illinois’s most significant economic problems currently? Therese McGuire: The public sector has been somewhat dysfunctional for quite a few years. Part of it is political difficulties between the parties, but also, for years, the state has been spending beyond its means. We have an unfunded liability in Illinois, and that unfunded liability has to do with the fact that our public pensions are not well funded. Also, in any given year, we spend more than we are raising in revenues, and so we run an annual deficit. Can you expand on how Illinois created this unfunded liability? TM: We have public pensions, so a lot of the public employees in this state are promised X amount per month from their employers for the rest of their life. The value of the assets that we have in our public pension fund today is less than 50 percent of the amount that we are going to owe people when they retire. No other state is as low of funding on their public pensions as the state of Illinois. States or public employers are supposed to put in what’s called an "annual required contribution" every year into the pension fund. Illinois, for many years, has not put in their annual contribution; they just skipped it. In order to have a well-functioning pension system, the employer, the state of Illinois, spends money on highways and all kinds of things, and they are also supposed to put money into the pension fund. The state made a wildly optimistic assumption about the interest the pension fund will earn. The money that's sitting in the fund is earning interest but not at the rate that we had been assuming it. Do other states have issues funding their pensions? TM: We have very generous pensions in this state. Some other states have grappled with this problem over the last 10 years, like the state of Rhode Island, which went in and did some reform to their pension plans and to the pension benefits, to make them less generous and less expensive. Other states do have generous pension systems too, but they've been putting in their annual required contributions and haven’t been missing their payments. The state’s hands are tied because it’s in our constitution that we cannot harm the value of the pensions. About 4-5 years ago, the legislature passed a bill which would have made our pensions less generous, but the Illinois state supreme court threw it out because they said it violated the constitution. Each constitution is unique to each state, and most other states don't have this constitutional prohibition that we have here in Illinois. What exactly happened with the budget crisis? TM: Every year the state is supposed to pass a budget, the governor proposes it, and the legislature then approves it, but from July 1, 2015 to July 6, 2017, we were without a budget. Rauner proposed a budget, the legislature said no because it was doing something they didn't like, and so then Rauner didn't want to do what the legislature wanted to do. The legislature counter-proposed essentially, and Rauner said no, and so then we just kept operating without a budget. A lot of human services agencies had to close their doors because they were heavily reliant on state grants for the services they delivered. How did the economy not just completely collapse? TM: It's not like revenues stop coming, a budget is just how we're going to spend our money. Also, a big chunk of state government is on kind of automatic pilot. For example, if you’re on Medicaid and you go to the doctor, and the doctor sends in the bill, that just has to get paid, maybe not on time, but it has to get paid. The other thing the state was doing was a continuing resolution, which is temporary permission to continue to spend money like we were doing before July 1, 2015. What does the future look like for the Illinois economy? TM: We’re a rich state; we have a higher average per capita income than many other states. We have the resources to pay off our debt long-term, but I don't think we have the will. We’re sitting with this unfunded liability: the state pensions, the city pensions, the Chicago Public School pensions. If you are a company thinking about expanding or opening a business, I think you would think twice before coming to Illinois because of that unfunded liability. We are on the shortlist for Amazon's second headquarters, and I think Amazon should think about whether or not they want to come and take on that liability with us, especially when you've got other very highly functioning cities nearby. This unfunded pension problem is the biggest public finance problem we're facing. There’s some pretty strong evidence that this fiscal policy uncertainty is a deterrent to economic growth, so I really think that Illinois getting its fiscal policy in order is the most important thing we need to do.